Collaboration with startups is a growing trend with large companies seeking fresh ideas, innovations and agile development from outside their own organization. Increasingly, governments and other economic development agents are also looking to startups as a source of economic growth and jobs. Startups are probably the most dynamic part of the business landscape. Although startups’ direct economic impact is limited due to their sheer size and high ‘mortality rate’, they can have significant effect to other, more established organizations. We should use startups as catalysts for business growth and economic development beyond themselves. The startups can speed up and guide the renewal in the collaborating organizations or challenge even the hostile ones. The effect should apply both to individual organizations and clusters, as well as to whole regional ecosystems and economies. It’s pretty obvious to ask how to instill some of that startup impetus to more established players, which have larger ‘mass’ and ready assets for growth. The idea is not new, one early example of the thinking is the ‘Fast Second’ already in 2005 where Markides and Geroski suggested using small creative ‘feeder companies’ to fuel innovation in large organizations. All the hype about ‘open innovation’ is not always resulting much action. However, now there is more both market pull and push. Maybe due to the slow growth of the markets, the large organizations are finally embracing the opportunities of collaboration. On the push side we see dozens of new players helping large organizations to ‘scout’ interesting startups or run startup competitions and accelerators. Consider also hugely increased global connections. There are much more tools than just couple of years ago – sort of ‘tech push’. 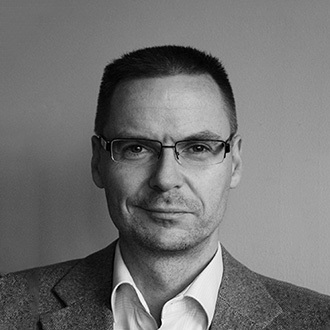 Finland is a case in point: rapidly emerged startup culture has changed the whole attitude towards entrepreneurship, also in larger organizations and maybe even in the government. Large part of the credit goes to student ‘activism’, most visibly the SLUSH startup event, which draws thousands of attendees to Helsinki in darkest November; now also spreading around the world to places like Tokyo and Singapore. Large companies are also making conscious efforts to develop entrepreneurial leaders across organization, not just in few separate units for ‘startup mavericks’. We have been fortunate to work with dozens of these talented managers along some bravest startup entrepreneurs. 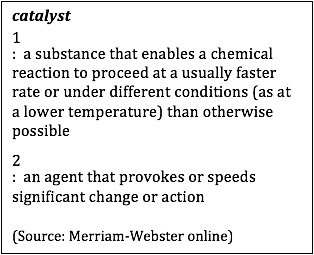 While the idea of catalytic startup is pretty intuitive, it is less clear why and how the possible effect really works, and – more importantly – what to do about the catalysts. To prime the discussion we offer here few observations based on our work with both startup entrepreneurs and large company people working towards the global startup ecosystem. First area of impact is obviously technologies and related intelligence – unrestricted by the corporate legacies the startups bring radical new ideas, potentially complementary or otherwise transformative tech (e.g. digitalization) and strategic intelligence from completely different perspectives. Some of this can challenge the interval views or even frustrate big company’s own R&D efforts. Traditionally the large organizations are secretive about their development work – but the startups are relatively open, even brash about their aims, and demand certain openness from their partners in return, and just for pragmatic reasons of getting things moving. Not insignificant the required openness exposes party’s strategy or lack thereof, both internally and externally, so you better sort out your strategy before you try anything fancy with outside parties. Third is startups’ acute action orientation – startups have a need to move, close deals; this maybe due to lack of finance or pressure from investors, or just sheer passion and hunger for advancement. Hence often noted difference in speed. Another area is customer orientation. Anxious to get feedback, many startups tend to go talk to potential customers and partners already at early stage, making them very interesting to large companies working towards the same customer groups. 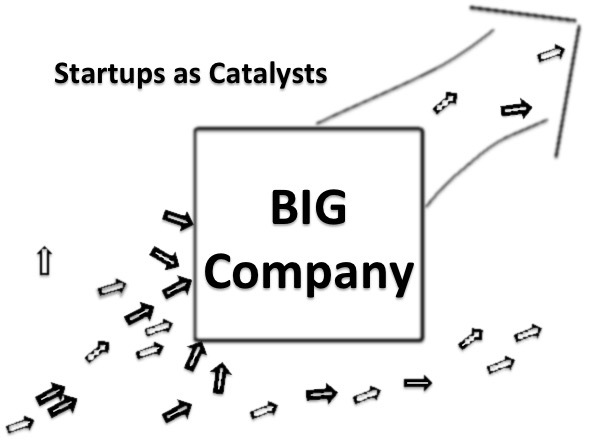 Fifth point revolves round competitiveness – startups will not hesitate to go talk to big company’s competitor if the first potential partner do not seize the opportunity and offer reasonable cooperation, this forces large company to react opportunity much faster and more concrete when compared with internal developments. In general, the resource-poor startups are networking much more aggressively causing different reactions in potential partners. Here startups can be likened to ‘free radicals’. The above pieces of puzzle hint for a picture that differs drastically from more slow-paced, often research-based R&D and collaboration schemes e.g. with clusters of big companies and universities. While startup collaboration cannot substitute for solid research, many believe it can bring valuable new impetus and – literally – out of the box innovations. Clearly, we need more research about this, preferably grounded in actual collaboration. Working with startups in smart manner could offer even relatively ‘small large companies’ new possibilities to cope with global opportunities and threats. Even those without global networks of R&D centers could still probe and test markets through collaborating startups. Similarly, mid-sized companies can ease their pains e.g. with digitalization by working with small agile partners, sometimes from adjacent industry. In summary, company aspiring to lead their industry in future should have large global network of both interesting startups and different startup-savvy partners; a portfolio of real options to ‘deal-flow’ of radical and different ideas, also beyond the current industry boundaries. Stay tuned: we will share more in no time. Meanwhile, we warmly welcome comments and challenges! The economists should think signaling, productivity and, inter alia, schumpeterian creative destruction: faster re-allocation of resources to more productive uses. Geroski, Paul; Constantinos Markides (2005). Fast second: How smart companies bypass radical innovation to enter and dominate new markets.